Bela’s mother apologizes to Vidhi. I did very wrong to you. Vidhi recalls begging Bela’s mother for help in the past but she had pushed her away. Bela’s mother says you always called me Ma whereas I was always only jealous of you. I thought you were snatching my daughter’s happiness and I always remained jealous of you. I supported that animal! Please forgive me. I dint know he will kill you! I dint say anything even when he kept hitting you right in front of my eyes. I thought he will spare your life. It was a small thing. Vidhi says we overlook such things thinking it to be a small thing. A son tortures his wife and his mother lets him do it thinking it is a small thing. Husband is called God yet he hits his wife. We think it to be a small thing. It is a wound which never heals. You became a part of his misdeeds by supporting him. You wanted Bela to marry Pushkar right? Would you have still kept quiet had he hurt Bela? We don’t see who is torturing whom! We need to always raise our voice against it! An Indian wife treats her husband like her God overlooking all his follies. Why to blame you when I am a bigger sinner than you? I bore them silently thereby giving him strength to hurt me more. It wouldn’t have happened if I had raised my voice. Women are losing everything by allowing men to hurt them. I was as much as fault as you were. Bela’s mother requests her to forgive her. You proved today that we are greater by our thoughts. I have made a mistake but I am taking this chance to do penitence. Please give me this chance. Rajshri says I will give you that chance. I will tell you what you have to do. She gives her a bottle of sleeping pills. You have to use them very soon. Bela’s mother looks at the bottle in confusion. Pushkar comes to his room. What’s happening to me? I get hurt by shards and then a chandelier. Is this a coincidence or is someone responsible for it? Who could it be? I cannot see anyone! He thinks of Vidhi. She is dead! It cannot be her! Ghosts don’t exist. He sits on the bed but jumps in pain / shock. Nails are kept on his side of the bed. He recalls keeping them on Rangeela’s bed in the past. Pushkar pulls Rangeela by his collar. You are trying to cheat the one who is letting you live here? I forgot all about you. Rangeela acts innocent. I am your Hanuman. Pushkar says how you can be Hanuman when I couldn’t be Ram. You have backstabbed me today. I saw the nails and could understand it is your doing. Rangeela insists he dint do anything but Pushkar drags him upstairs with him. Pushkar tells him to look at the bed but there is nothing. Rangeela asks Pushkar if he is fine. You have been acting strange since yesterday. Pushkar sends him outside. What’s happening to me! I see something for a moment but it disappears the very next second! I can dream at night but how can I day dream? It cannot be wrong! Something is indeed going on here. It couldn’t be Rangeela as I brought him here with me. I think I need to rest. He drinks water and lies down. I should go on a long vacation and then resume office. Kabeer is also not here. Everything will be settled! Pushkar wakes up and finds himself ties in a carpet. He struggles to be freed and calls out for help. A shadow appears. He demands to know who it is. Please get me out. Vidhi steps forward. Are you feeling suffocated Pushkar? This is how you had wrapped me in the past. He begs to be freed. She says you are too smart. Think what you will do now. You dint fulfil any of your promises. You broke all the 7 promises! You killed me mercilessly. Today, I will do the same to you! He shouts for his mother as Vidhi lifts a flower pot high in the air. He begs her to spare his life for God’s sake. She tells him God doesn’t have so much time. He punishes people right here for their misdeeds. It is your turn now. He turns and manages to escape getting hit. By then, Vidhi has disappeared. He is badly shaken. Can it be Payal’s ghost? Rajshri and Rangeela come running there. What happened? He is looking at the carpet. Rajshri asks him what happened. Pushkar lies that he saw a bad dream. She suggests him to rest. She begins to go but stops. I never saw this carpet in this room. Anyways, take rest. Rangeela asks Pushkar why he was shouting. What is with this carpet? Pushkar asks him if he believes in ghosts. Rangeela says educated people don’t trust it but I have heard many stories in my village. Why do you ask? Pushkar admits that he saw Payal’s ghost. Rangeela asks him how it could be when Payal is alive. You would have seen Vidhi instead. Pushkar tells him to remove the carpet. Rangeela starts chanting mantras as he starts folding the carpet. Rangeela tells everyone that their plan is going on the right path. Pushkar is freaked out right now. Kabeer says it feels nice to see him scared. He has been scaring everyone all along. I wonder how this game will end. Rajshri says he will have to accept his crimes so Vidhi gets justice. Scare him so much that he ends up confessing everything on his own. Vidhi tells her she is the first DIL who is doing this. Rajshri says every mother would do the same after knowing the pain her daughter went through. Vidhi reasons that she is Pushkar’s mother too but Rajshri refuses. I never thought he will be so ruthless to a woman and kill her! He does not deserve any mercy after whatever he has done to you, Rangeela, Badri and many other people. The man who cannot respect woman can never be anyone’s ideal son, brother or husband. It is a very big day for us tomorrow. It should be so grand that Pushkar is not able to hide anywhere. He has to confess his crimes tomorrow! Next morning, Kabeer mixes ice in water. Pushkar is bathing. The water turns ice cold suddenly startling Pushkar. He slips on the floor and struggles to switch off the tap. How did it turn so cold suddenly? He recalls throwing ice cold water on Vidhi once. Vidhi puts a gas in the pipe. He is about to get out of the bathroom when he notices smoke. He is again thinking of how he had tried to suffocate Payal / Vidhi recently. He tries to open the door but in vain. Rangeela is holding it from outside. Vidhi hears his pleas and remembers how she had also been shouting for help. Pushkar breathes heavily. Precap: Pushkar is certain that Vidhi’s ghost is seeking revenge from him. Kabeer says we should take our next step now. Rajshri remarks that the next step needs to be very crucial. With this, we have to make him accept his crimes. Pushkar has caught hold of Vidhi and has covered her mouth so as to stop her from shouting. We wont go from here but from backdoor from where you started your ghost game! 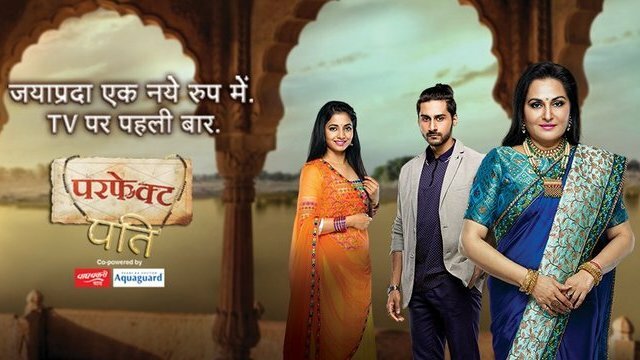 The post Perfect Pati 20th February 2019 Written Episode Update: More tortures on Pushkar appeared first on Telly Updates.